Tick-borne illnesses are increasing in prevalence and geographic reach. Because the presentation of these illnesses is sometimes nonspecific, they can often be misdiagnosed, especially in the early stages of illness. A detailed history with questions involving recent activities and travel and a thorough physical examination will help narrow the diagnosis. While some illnesses can be diagnosed on clinical findings alone, others require confirmatory testing, which may take days to weeks to result. This issue reviews the emergency department presentation of 9 common tick-borne illnesses and evidence-based recommendations for identification, testing, and treatment. A 10-year-old girl presents to the ED with left knee swelling and pain. She has been able to walk, but the swelling and pain have become worse over the last 3 to 4 days. The girl says she has not had a fever or chills, and there is no known trauma. The girl’s mother states that her daughter spent 3 weeks at summer camp in Connecticut a few months ago, but otherwise has not traveled recently. On examination, the girl’s knee is swollen, but without erythema or warmth. The girl is able to bear weight, but she is unable to fully flex her knee. X-rays of her knee are significant only for a joint effusion. Should you perform an arthrocentesis of the girl's knee? What lab work would help in making the diagnosis? What are the best treatment options for this patient? An otherwise-healthy 8-year-old boy is brought in by paramedics for altered mental status. He is lethargic, responds only to painful stimuli, and has incomprehensible speech. The child has had fevers, headache, and vomiting for the last 5 days. The boy’s vital signs are as follows: heart rate, 150 beats/min; temperature, 39°C (102.2°F); respiratory rate, 30 breaths/min; oxygen saturation, 98%; and blood pressure, 75/40 mm Hg. On examination, you note a diffuse petechial rash on his trunk, arms, legs, palms, and soles. The boy’s mother tells you the rash has been spreading from his extremities to his abdomen over the last few days. What initial laboratory studies would help you make a diagnosis? What additional complications could arise? Is doxycycline safe for this patient? Tick-borne illnesses often present a diagnostic challenge for the emergency clinician. Tick bites are usually not painful, and patients are often unaware of the bite1 because the initial local reaction to a tick bite may be similar to the bite of another insect, such as a mosquito or a chigger. Tick-borne illnesses can be easily overlooked on a patient's initial presentation to the emergency department (ED), because the risk and exposure may seem minimal, such as simply playing in the backyard or having a pet that may bring ticks into the house. Nonetheless, many tick-borne illnesses can lead to serious or life-threatening sequelae if left untreated. This issue of Pediatric Emergency Medicine Practice discusses the presentation of 9 tick-borne illnesses, reviews the differential diagnosis for each illness, and provides recommendations for the diagnosis and management of these illnesses in the ED. A literature search was performed on PubMed using the search terms: pediatric tick, tick-borne illness, tick-borne disease, pediatric Lyme, pediatric Rocky Mountain spotted fever, pediatric tick paralysis, pediatric babesiosis, pediatric ehrlichiosis, Rocky Mountain spotted fever, tick paralysis, babesiosis, ehrlichiosis, anaplasmosis, tularemia, meat allergy tick bite, and red meat tick bite. A total of 177 articles published between 1998 and 2018 were reviewed. The Cochrane Database of Systematic Reviews was searched using the key terms: tick-borne, Lyme, Rocky Mountain spotted fever, tick paralysis, babesiosis, ehrlichiosis, anaplasmosis, tularemia, and tick-borne relapsing fever. This search identified 1 review on the treatment of neurologic manifestations of Lyme disease. According to standard evidence-level scales, the majority of evidence for tick-borne illnesses falls into the weaker and moderately strong categories. Tick-borne illnesses are relatively rare diseases, particularly in the pediatric population. Currently, there are few randomized controlled trials evaluating treatments for tick-borne illnesses. The majority of studies are based on retrospective and prospective observational studies. 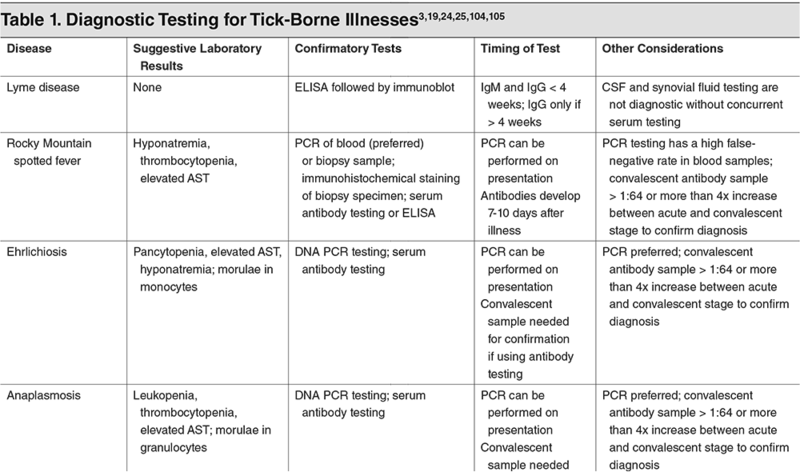 There are a number of review articles with recommendations based on observational studies, expert consensus, and case reports on rare complications of tick-borne illnesses. 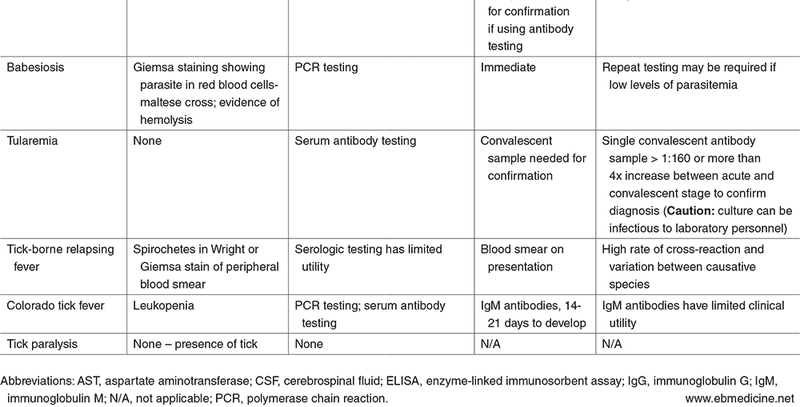 Many of the pediatric recommendations for the diagnosis and management of children with suspected tick-borne illness are based on adult literature. While there are areas that are highly endemic for certain diseases, tick-borne illnesses have been reported in all of the contiguous 48 states.154 A thorough travel history is critical to identifying possible tick exposures, as cases acquired during travel to endemic areas may be easily missed.155 Patients may also be exposed during international travel.156,157 Excluding a specific disease based solely on geographic location may delay diagnosis and increase the risk of developing complications. Common presentations of tick-borne illnesses include fever, myalgia, rash, fatigue, headache, vomiting, and diarrhea. Consider tick paralysis in patients who present with ataxia and ascending paralysis; facial nerve paralysis and ophthalmoplegia may also be present. A vital component of the physical examination is a thorough head-to-toe examination for the presence of a tick, particularly in the hair, axilla, and groin, where attached ticks can be easily missed. If a tick is found, remove it using tweezers or fine-tip forceps by grasping the head of the tick near where it enters the skin and pulling the tick straight out with gentle, even pressure. 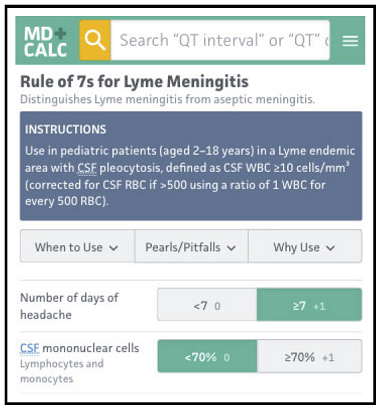 The Rule of 7s for Lyme Meningitis is a validated clinical prediction rule to distinguish Lyme meningitis from aseptic meningitis. The Rule of 7s should not be used in settings in which patients do not have access to close follow-up care by a medical provider. If the cerebrospinal fluid (CSF) red blood cell count is > 500 cells/mm³, the CSF white blood cell count must be corrected using a ratio of 1 white blood cell for every 500 red blood cells in the CSF cell count. The Rule of 7s has been validated by a retrospective cohort study of 423 children in Lyme-endemic areas. It can help guide clinicians in assessing the need to initiate antibiotic therapy for Lyme meningitis, versus observation and close follow-up care. Have undergone a lumbar puncture and the CSF demonstrates pleocytosis (CSF WBC count ≥ 10 cells/mm³, corrected for CSF RBC count if > 500 cells/mm³ by using a ratio of 1 WBC for every 500 RBCs). If the patient is at low risk for Lyme meningitis, consider discharging the patient after stressing the importance of follow up with a primary care provider. If the patient is not at low risk for Lyme meningitis, consider treatment with an antibiotic that covers Borrelia burgdorferi, using an age-appropriate dosage. Abbreviations: CSF, cerebrospinal fluid; RBC, red blood cell; WBC, white blood cell. This tool should be used to assist clinicians in decision-making, not to replace clinical evaluation of a patient. Patients with scores of 1 to 3 points are not at low risk for Lyme meningitis, and antibiotic therapy for Lyme meningitis should be considered for these patients. Patients with a score of 0 are at low risk for Lyme meningitis; their symptoms may be due to aseptic meningitis or another etiology. Clinicians should use clinical judgment and consider whether the patient has access to adequate follow-up care before initiating antibiotic therapy. The Rule of 7s is meant to aid in the decision to begin antibiotic therapy for suspected Lyme meningitis. It should not replace clinical judgement and clinician assessment of patients. Avery et al (2006) first derived a clinical prediction model to calculate the probability of Lyme meningitis in children from Lyme-endemic regions, using a statistical analysis of history, physical examiniation, and laboratory findings. Their model was prospectively validated by Garro et al (2009) in a study of 50 children aged 2 to 18 years who lived in a Lyme-endemic region. Fourteen of the children had Lyme meningitis, 6 had possible Lyme meningitis, and 30 were ultimately diagnosed with aseptic meningitis. Categories of low (< 10%), indeterminate (10%-50%), and high (> 50%) probabilities of Lyme meningitis were derived based on the percentage of CSF mononuclear cells, duration of headache, and presence of cranial nerve neuropathy. The positive predictive value with a cutoff of > 50% probability of Lyme meningitis was 100% (95% confidence interval [CI]: 66%-100%). The negative predictive value with a cutoff of < 10% probability of Lyme meningitis was 100% (95% CI: 82%-100%). The authors noted that when patients had < 7 days of headache, < 70% CSF mononuclear cells, and no seventh or other cranial nerve palsy, the probability of Lyme meningitis was always < 10%, indicating that those patients were at low risk for Lyme meningitis. The authors termed this the Rule of 7s. The Garro et al study was validated in a large retrospective cohort study by Cohn et al (2012) using electronic medical record data from 3 pediatric emergency departments in Lyme-endemic areas. The sample of 423 children, aged 90 days to 19 years, included 117 children who were diagnosed with Lyme meningitis and 306 who were diagnosed with aseptic meningitis. The specificity of the Rule of 7s for low risk was 41% (95% CI: 36%-47%), and the sensitivity was 96% (95% CI: 90%-99%). Garro AC, Rutman M, Simonsen K, et al. Prospective validation of a clinical prediction model for Lyme meningitis in children. Pediatrics. 2009;123(5):e829-e834. DOI: https://doi.org/10.1542/peds.2008-2048. Describe presenting signs and symptoms in children with common tick-borne illnesses. Determine appropriate workups and manage children with tick-borne illnesses and related complications. Discuss complications that can arise from undiagnosed or late presentation of tick-borne illnesses. Date of Original Release: September 1, 2018. Date of most recent review: August 15, 2018. Termination date: September 1, 2021. Faculty Disclosures: It is the policy of EB Medicine to ensure objectivity, balance, independence, transparency, and scientific rigor in all CME-sponsored educational activities. All faculty participating in the planning or implementation of a sponsored activity are expected to disclose to the audience any relevant financial relationships and to assist in resolving any conflict of interest that may arise from the relationship. Presenters must also make a meaningful disclosure to the audience of their discussions of unlabeled or unapproved drugs or devices. In compliance with all ACCME Essentials, Standards, and Guidelines, all faculty for this CME activity were asked to complete a full disclosure statement. The information received is as follows: Dr. Bellis, Dr. Tay, Dr. Gottlieb, Dr. Nigrovic, Dr. Mishler, Dr. Claudius, Dr. Horeczko, and their related parties report no significant financial interest or other relationship with the manufacturer(s) of any commercial product(s) discussed in this educational presentation. Dr. Jagoda made the following disclosures: Consultant, Daiichi Sankyo Inc; Consultant, Pfizer Inc; Consultant, Banyan Biomarkers Inc; Consulting fees, EB Medicine.